Tea Gardens Auto Electrics & Mechanical is a total car care business specialising in the latest modern electronic control system components. Whether your vehicle is a small family car or a large passenger, or freight carrier, we can get you back on the road in our modern spacious workshop. As a Bosch Service Dealer award winning workshop your Peace of Mind is of the utmost importance to us. It is for this reason that we are not only an Authorised Bosch Automotive Service Dealer but also strove for acceptance as a NRMA Approved Repairer plus Denso Accreditation. These accreditations mean Nationwide Warranty on all our work for you, our customer. The technicians at Tea Gardens Auto Electrical & Mechanical are highly skilled & just one of the things that stands them apart from their competitors is the factory training they attend as a Bosch Automotive Service Dealer. Bosch Australia has access to the latest technical information and the on-going, world class training programs which are essential to keep abreast of the rapid advances in automotive technology. 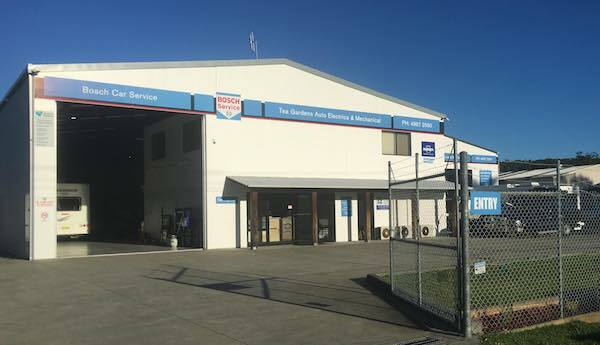 Tea Gardens Automotive Electrical & Mechanical Service Centre are regarded by their peers to be one of Australia’s leading Automotive Service Centres. Rod & the team have taken out the Best Australian Automotive Service Centre Award in 2002, 2008, 2009 & 2012. Rod & the team also won the Bosch Q Cup & represented the other 500 plus Australasian Bosch Automotive Service Centres in Europe. Tea Garden Auto Electrics & Mechanical is conveniently located in the first Factory in the industrial area as you enter Tea Gardens, from the Pacific Highway.